We don't have the Fall 2009 TA assignments finalized yet, and the web site won't go live until we do, but here's a little bit of information to get you started. You will need three things for 204 lab: a LAB MANUAL, a LAB NOTEBOOK, a COMBINATION LOCK, and a CALCULATOR. Lab Manuals are $20 at the Co-op along the back wall. You must have the Fall 2009 edition with the orange and white cover (see picture below). Buy yours early because the Co-op usually runs out! 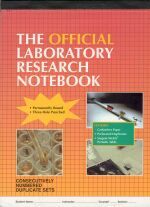 Lab notebooks like the one pictured below are $14.50 from the Duplicating office in the main hallway of Welch (room 2.228) or $15 at the Co-op. It doesn't have to look like the one below, but it does have to have 100 DUPLICATE, NUMBERED pages. 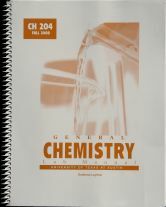 Most students use 70-90 pages over the course of the semester. You can buy a combination lock from the Co-op for $5.15 in aisle 7, from the CH204 stockroom for $5, or from the Duplicating office in WEL 2.228 for $3.88, or just get one anywhere that fine personal security devices are sold. Gotta be a combination lock. No padlocks. Lab Notebook. $15 at the Co-op or $14.50 from the Duplicating office in the main hallway of Welch.